Carnival Corporation (CCL): Time to Buy? Carnival Corporation (NYSE:CCL) has endured a flurry of bad publicity amid the horrific Costa Concordia disaster as well as multiple breakdowns in the Gulf of Mexico that left passengers stranded without modern plumbing. Although the events relate to only a small percentage of Carnival Corporation (NYSE:CCL)’s massive fleet of ships, the public relations disaster weighed heavily on first quarter bookings — the biggest booking quarter of the year. As a result, the stock has slumped to a level that may be attractive to long-term investors. Before analyzing the company’s long-term prospects, let’s take a look at its response to the Gulf of Mexico breakdowns that are weighing on its business. The company recently announced plans to invest $600 million to $700 million on safety and hospitality systems; this is the most it has ever spent on operational enhancements. The enhancements include upgrades to the ships’ engine and fire systems and a back-up power source to the plumbing system. While the upgrades should lessen the chance of primary propulsion failure and make customers more comfortable during a crisis, the real value of the investment is its ability to fight the perception that Carnival Corporation (NYSE:CCL)’s cruise lines are out of date. In other words, investors may well view it as a $700 million marketing campaign to re-build the company’s image. Long-term investors should not be concerned about the recent mishaps. Carnival dominates the cruise industry, with only Royal Caribbean Cruises Ltd. (NYSE:RCL) posing a serious competitive threat. 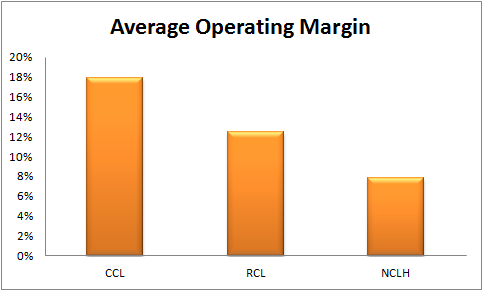 The next-closest competitor, Norwegian Cruise Line Holdings Ltd (NASDAQ:NCLH), is much smaller. Scale is the most important attribute in the industry; new cruise ships are expensive and require long lead times. In addition, there are only so many shipyards that can build cruise ships, so the supply of ships is constrained. As a result, it is difficult for up-and-comers to reach the scale necessary to compete with the biggest players. Carnival Corporation (NYSE:CCL) has the biggest fleet in the world; its 100-ship fleet towers over Royal Caribbean Cruises Ltd. (NYSE:RCL)’s 40 ships. And while Royal Caribbean has larger ships, Carnival consistently earns more per room than its rival. 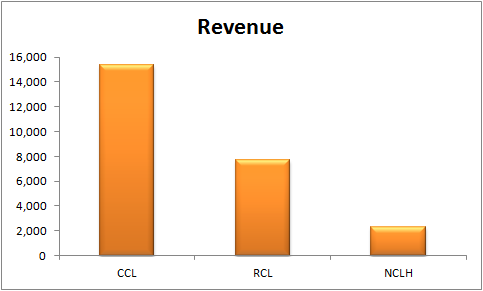 NCLH, by comparison, lacks the scale to consistently out-earn its larger rivals. The high fixed-cost nature of the cruise business makes it unlikely that Norwegian Cruise Line Holdings Ltd (NASDAQ:NCLH) will ever be able to compete with Carnival. However, a combination of Royal Caribbean and NCLH could pose a viable threat, especially considering Royal Caribbean Cruises Ltd. (NYSE:RCL) is already competitive in many of the markets in which both it and Carnival Corporation (NYSE:CCL) compete. However, there are serious doubts as to whether regulators would allow such a combination.